If you need to call the Mini customer service number, dial 866-ASK-MINI or 866-275-6464 to speak to a live person. Hours of operation are Monday-Friday from 8am-6pm EST. Mini Cooper is a division of BMW and a popular brand of cars in the SUV and adventure category. Originally built in the UK, Mini gained popularity in the 1960's due to their fun design and unique look and shape. 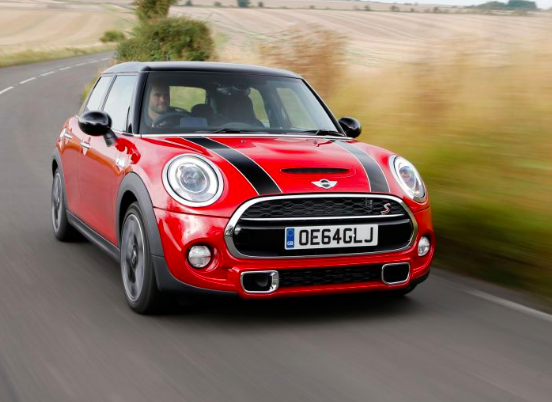 Today, Mini Cooper is a thriving company with corporate headquarters around the world. If you have problems with Mini Cooper customer service, the best method of contact is by emailing the corporate office. Many customers have done this to voice their feedback and concerns. Common issues with Mini Cooper include mechanical failures, safety recalls, and warranty problems. If you have opinions on Mini, please do not hesitate to tell us what happened by sharing your story with us on our website. I have never before had I had the run around from a car company to the point that I have had to write an executive at the company to get help on a customer issue that should have been simple to resolve but no seems to be in charge. It is a long story but demonstrates how one hand does not know what the other is doing provides no positive results for the customer. Left front axel retaining clip broke within 41 days of purchase the vehicle, leaving my wife stranded in the middle of the road. It was replaced at the dealer's service department. During the car's pick up, we scheduled an appointment for my wife to learn about the vehicle's latest technology, offered by Mini. To our surprise, when she arrived at the dealer there was no record of the appointment, all this after Mini USA called acknowledging the appointment. During the call I was told that Mini USA has authorized the dealer to issue a $500 voucher for accessories for the inconvenient. To our surprise again, when we inquired about the voucher, the dealer was not aware of the authorization. We are very concerned with the experience thus far, and with the brand commitment to a good customer experience. I owed $325.88 for wear and tear on 2016 Mini Cooper Countryman. The check was sent November 1, 2018. On November 2, 2018 I received an automated phone call and I was able to press I sent the payment. Since that time I have received a phone call everyday, including another call that I pressed the button that I sent in the payment. The receipt I was given to mail in did not have my name, only this number 4002302020. Please check for the check sent. I have a 2019 Countryman and am not happy in the manner I am being treated by the corporate financial department. Un senor de nombre Jerome llamo a un vendedor llamado Jose para que me ayudara con la traduccion. Jose me dijo que mis dudas me las debia aclarar el financista llamado Martin Perez. work. They(Oscar) said they were so busy that it would be more than 2 hours for the work. Appointment was no factor. I called and spoke to a manager(Colin) and explained the problem. He said to reschedule and he would make sure I got a loaner. So I did. I picked up the loaner another day and called the following day to see what time frame I would have before the work was done. I was told the service person(Oscar) I was working with was sick and they would have someone else call me. Nobody did. So the following day I called early morning because I was going out of town and needed to see if my car was going to be done. No one called so I called the manager(Colin) again and he did not answer so I left a message. He did not call me back so I went ahead and headed to my destination around 10am. I received a call from Marco stating if I had any questions to please call. I tried to call him and I left a message stating I needed an answer because I was getting out of range , Did not hear back. Then I heard from Alex that my car was ready. I turned around and drove an extra 40 minutes to go get my car. When I got there they said my car was not ready. I told them I spoke to Alex. He came forward and said it was ready. When the girl that goes to get the cars came back and told another person her car was outside running with the air conditioner due to it being hot outside. She came and told me my keys were in the car. I got in my car an left. They did not clean my car, reset the oil change if they changed my oil not sure. Did not check my tire pressure. Broke the head rest knob in the back seat. Never got any paperwork to see what they claim they did. This is the worse service department I have ever been involved with. My girlfriend's car had engine code and relate to thermostat housing need to be replace. I ordered new thermostat housing and new adapter harness for engine temperature sensor. So this adapter will for the new housing but not connect to anything on this engine harness. Nobody is helping me with this. 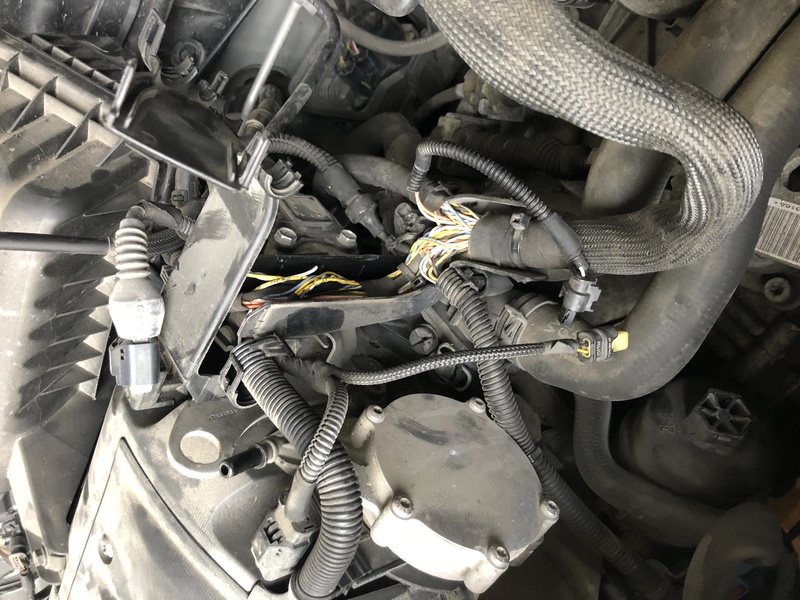 I found a technical bulletin and it said it need to replace the engine wiring harness. Well I don't think that anyone has done it to this car. And said it under warranty regardless of time and mileage. I try to talk to service department about and they don't know. They said to contact you. Please help me with this. I have pictures of vin and wiring harness for this car. The worst customer service EVER. The only thing they care about is for you to take a survey. You tell them your problem and the answer is, can’t help you. NEVER again will I buy a Mini. If you are reading this, DON’T buy a Mini Cooper. I'm a potential customer that has been working with Carmax of Orange Park Fl. I had a mini cooper transferred from down south on & Oct 2017, it arrived in Jacksonville, fl on 10 Oct 2017. It was immediately sent to the Mini Dealership on Atlantic Blvd, where is was due to get checked before I buy it from Carmax. It is now 20 Oct 2017 and the service manager at Mini, can't tell me a time frame of when the car will even be looked at. I keep getting the run around as to how long the car will be ready to send over to Carmax. Can someone from the corporate office please find out and let me know how can I deal with this issue. Thank you in advance. I own a 2009 mini cooper s. I've been experiencing start up trouble and occasional surge while driving. I've read where this, along with these pumps dying while at highway speeds a very dangerous situation, is an issue with the cooper s models high pressure fuel pumps. I understand that the warranty on these pumps have been extended to 120,000 miles or ten years. According to "The Haus"...they recommend taking the vehicle to an authorized mini dealer asap so that possible warranty coverage may be verified. I went to my local mini dealership explaining of these same symptoms. I presented them with a video of me starting my car several times before it would run. You would think i had a diesel engine under the hood. The dealer said that issue is carbon build up inside the engine and that I needed spark plugs. Well...I just changed my plugs 2 weeks ago and have always used premium gas going so far as to add a cleaning agent every several fill ups. I've used seafoam at oil change intervals to aid vs carbon build up. I am fully aware of how direction injection works and how deposits form. I have been steadfast in my maintenance regiment. I just don't understand why they just didn't replace the pump given all the evidence. I travel on average 120 miles a day and truly love my mini one of three that I have owned. Even if the pump being the reason for my problem is uncertain given their investigation...wouldn't it make sense to replace it and avoid a potential incident going forward. I'm not upset with the dealership. They seemed concerned. I'm upset with the result given the potential dangerous and unsafe situation I might find myself in. Your input regarding this issue would be greatly appreciated. I purchased the no longer made paceman based on the salespersons assurances that there could be a "computer chip" placed easily in the car as when I drove it I noticed it had not much pick up. I have since found out this can not be done. I spoke with the manager at Dublin Ohio Mini Mag who said he would research that and would find a way to help my car have some pick up so I don't get hit while trying to pass a car and can't do it because it won't move. I never heard back from him. I have asked repeatedly at the dealership where I purchased it and they suggest that I trade it in for another of their cars, an "s" version. Why in the world would I want to buy another car from a dealership that has lied to me not once but on several occasions and does nothing about it. The car is a dog. It is heavy and can't move but at a snails pace. When anyone asks me how much I like it I am quite vocal about it. It's too bad, it's a cute car but I got a lemon and they won't do anything about it. They close ranks and start double talking. They know it's a badly made car, it's not made anymore for a reason. It's dangerous and I'm just waiting for the day I get I to an accident because of it. I am so not pleased with the service at Mini Cooper in St. Louis that I was getting ready to purchase a new car. Then my headlight on the drivers side went out and it cost me 421 dollars to replace. I'm sorry but I'm a widow and on a tight budget. I feel that cost for a burned out bulb is ridiculous. I purchase a pre owned mini cooper three years ago from Irvine Mini in Irvine California. for the last three years the engine light and constant stopping of the vehicle is the norm. The vehicle# BT253588. I am at a cross road with this vehicle I feel its a Lemon and I am looking forward hearing from you. Should I complain directly to Mini HQ or should I try to call customer care directly? Dear Ms. Mariella Kapsaskis, I have been a Mini enthusiast for years and a Mini owner for 4 years. My first Mini was a 2010 Cooper S Convertible. My second a 2013 Mini S Hardtop. In the process of trading in my 2010, I gave Mini of Tucson an opportunity to make me an offer. The Salesman, Marvin Batts, came back with an offer of $3000.00. They offered me $5000.00 then deducted $2000.00 for “reconditioning”. I very calmly told Marvin that he should be embarrassed with this offer. I told him that I will never buy a vehicle from Mini of Tucson and that if I had another option for service, I would use that as well. I drove 120 miles North to Mini of Tempe and was given a fair offer on my 2010 and I purchased my 2013 in Tempe. The experience at Mini of Tempe was a true Mini experience. The people at Mini of Tempe “speak” Mini and truly love the vehicles. Right before the Mini takes the States even, I took my “new” 2013 to Mini of Tucson to have a few accessories installed. I was very excited about the event, as this was the first time I had participated. Mini of Tucson was not even aware of the event. They had no idea what I was taking about. Another interesting side note was that they new manager of Mini of Tucson, not sure of his name, didn’t even bother to introduce himself to me when I was there in the shop for about two hours. I was speaking with an employee, at the service department, and I asked who the gentleman whom I did not recognize was. I was told me that was the new manager. The shop was empty, except for me, and he must have walked past me 20 times without a hello. I told the employee I thought that was rude and poor business, and she replied that “you are not an 18-year-old college girl.” Really professional. So this week I contacted Mini of Tucson, Ali Naim, Business Office Consultant, for information in extending my maintenance plan. I had gone to Mini of Tucson on the 16th of September because I had an engine light on, and Angela Horne, a service advisor there, printed out a list of maintenance programs that my vehicle is eligible for. The prices for the warranties offered were: Program Code 0000000160 MP 60MO/75k MLS EXT MRSP $1670.00. Program Code 0000000146 MP 72M/100K EXT ELIG $1995.00. Program Code 0000000342 NEXT WRAP UP 7/100 MSRP $1995 W/ $50.00 Deductible. Subject: RE: Warranty Information. Good morning Stacey I hope you are having a great start to your day. The Maintenance extension is $2555. However, the service department is currently running a special on MPU's or maintenance upgrades. Anyone wanting to extend maintenance on their current MINI can get a $250 discount from the MPU. So it would be $2305 and there is no tax so that would be total cost. Regarding financing options unfortunately financing the MPU is only available at the time of the purchase. Let me know if there is any other questions I can assist you with, or if you would like to extend you current Maintenance. When I questioned Mr. Naim about the differences in the prices, this was his response. Good morning Stacey the information that Angela provided did not show the $250 surcharge the MINI the manufacturer charges for any vehicle the is beyond the manufacturers warranty. Your vehicle is currently out of factory warranty. Also these numbers are what the upgrade cost us the dealer. I would not be able to sell this warranty at our cost and an additional $250. However being that the mistake was on our end I will honor the quote Angela gave you for the service upgrades, but I am unable to discount them as well. So I contacted Tom Lobenstein at Mini of Tempe, whom I have dealt with in the past and asked him about the Mini “surcharge”. Tom told me that, “Don’t know anything about the surcharge --- they do charge $200 more for maintenance if the maintenance is expired; however, if the warranty is expired (it is not – you have a CPO) they will only sell you a powertrain warranty”. I then asked Tom for the prices for the available warranties for my 2013 and was given these. My 2007 Mini Cooper had a major engine breakdown. I am formally requesting a refund with corporate. We have had nothing but problems with the Mini Cooper. We bought it with 30,000 miles and it now has 50,000 and had broke down multiple times. I wool continually steer people away from mini and BMW as that's my other car which is broke down too. They are expensive cars that are built very poorly and are bucket of problems. Please help us force mini to make this right and either replace or fix my Mini as its breaking me. Terrible service! My wife has this Mini Cooper convertible with a yellow led on and off since three months; they've told her it's a thermostat or something; they are in back-order, but it's three months my wife is going around with this light that goes on and off on her dashboard, without having any written warranty this is not causing any damage to the car and that in one year nothing will be broken. No replacement car, no assistance. We cannot sell the car, of course, we are stuck with it, we are not getting any assistance; these guys in the Mini service department are so friendly ("Oh, we apologize", "Sorry, it's not our fault", etc. ), but they are not offering any real solution to the problem. I'm very pissed off with them; they've completely lost their reputation; I'll never buy a Mini anymore. Purchased my 2012 Base model Mini, manual transmission Aug. 2015, 31000 miles. Been mechanic my adult life. Started getting the timing chain death rattle soon there after. Took it to Seattle Mini told noise from bad clutch, tried to sell me a warranty for 1800.00 plus to fix it refused. Next day after cold start they replaced timing chain under warranty. Now has 44,000 miles, took it back at 41,000, death rattle returned. Seattle Mini claims not the chain, says normal. Trying to stall me until it is out of warranty at 50,000 miles. Scum bags. First of all I'm from Kissimmee Florida purchased a mini Cooper clubman S 2011. Beautiful car but notice I had a slight rattle prior to buying I was insured by the mechanic that that's the mini cooper sound. When I purchase the car it only had 58,000 Miles. Took the car to Orlando mini USA Told by technician that my car was fine but at the role testing it he said I needed a timing chain. I asked him about the recall he said I had the N 14 engine which was not included in the recall. Gave me an estimate of $1800 I was under the impression a timing chain glasses well over 100,000 miles in a timing belt around 75,000. My car hasn't even reached that. Hoping I can get some answers what to do I know it's easy to pay for if you have that kind of money when you're ready still owe car. I own a 2011 Mini, Cooper clubman S R 55 n14 engine. I purchased it with 58,000 miles It herd a little rattle the mechanic from the dealership said that's the mini cooper sound. I took it to Orlando MINI USA. They asked me for $1.800. To replace chain help me please I still 5 years on this car. I have made several wholehearted attempts to validate the account, contractual obligation and debt BMW/Mini alleges I owe. BMW/Mini failed to comply with my request for complete and full documentation supporting the debt within 30 days as required by Fair Debt Collection Practices Act, 1: USC 1692g §809 (b). To date I have only received a one page letter saying "sorry you owe the debt". That is it nothing further. My calls and correspondence are being purposefully disregarded. BMW/Mini has refused all my letters and calls. They refuse to provide me with complete documentation of account info, contractual agreements or debt owed. Their false and inaccurate reporting has destroyed my credit and recently caused me to be denied for a mortgage. It is unbelievable that a corporation can do this to someone. I am writing this letter to inform you of the fraud, forgery and extortion that has occurred to me when leasing an auto from Mini Cooper located in 280 Sunrise Hwy, Freeport, NY 11520. I leased a 2013 Mini cooper at the above dealership and have returned the car to Herb Chambers BMW/ Mini Dealer in Boston with 29,054 miles of usage. I currently reside in MA but lived in NY when I signed my lease. When I originally obtained the car, the lease terms specified 30,000 miles for 36 months. Unfortunately, I have been surprised by Mini financial Services headquarters at the end of my lease that the lease contract they have on file does not specify that information, rather they have a lease contract that is signed showing I was only allowed 22,500 miles for 36 months. For three years as long as I kept my contract, in good faith have made a conscious effort not to go above the 30,000 miles so that I wouldn’t pay the overage per mile at 0.20 cents per mile. The contract they have on file cannot be my signature or what I agreed to because I have kept my original signed and dated. To my disbelief I suspect a contract was forged on my behalf at Mini Cooper of Freeport and subsequently forwarded to Mini financial services. I have made numerous attempts to contact the original salesman names Steve Jawvorski at this dealership which I believe is responsible for forwarding a contract I never signed and only spoken to various sales managers who will only agree to help me if I decide to re-lease a car from them. They have also disclosed to me that they cannot find a copy of my lease which is alarming. I feel this is also a form of extortion and it is very upsetting to walk into a business to sign a contract in good faith not having anyone honor it. I have forwarded this letter to the Attorney General's Office and hope this issue is resolved as soon as possible. More importantly, I hope that this never happens again to any consumer moving forward. I will never do business at this dealership again. Terrible customer service from Mini Cooper! Dear Mini Cooper customer service department. I am writing today with concern about an issue. I recently took my 2004 mini in to the local dealer for my power steering recall. They took care of the problem but I was also informed that the 02 sensor was under warranty for 10 years or 100 thousand miles. I talk to Thomas the manager at the Buford dealership and he told me to give him my invoice which I did. He later informs me that he didn’t see anything on my invoice mentioning that the 02 sensor were faulty. He asks me to show him any documentation saying that it was faulty and he could resolve the matter. After looking through my paper work, I found my emissions letter which states that the 02 sensor was faulty. I called Thomas back numerous of times to let him know that I had the emissions letter and he never responded. 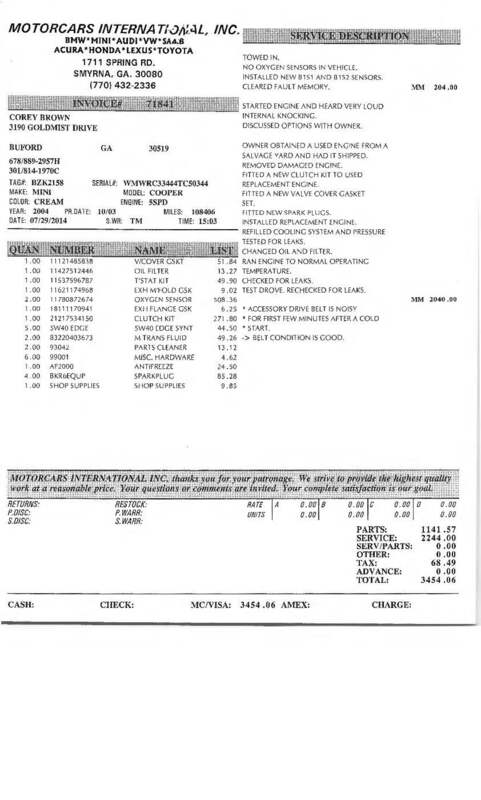 Here is the invoice and my emissions test I hope someone can resolve this matter without having to take my complaint to the Mini Cooper corporate offices. We noted loss of power steering on our 2004 Mini S (with 88k miles) beginning about 3 months ago and have tried unsuccessfully to verify that our vehicle should be included under the mystical extended warranty program. We are simply told that our VIN is not included, and no one can provide specifics about the warranty extension. We find it very hard to believe that our vehicle manufactured during the warranty window could somehow have developed the same problem due to some other non-warranty associated defect. 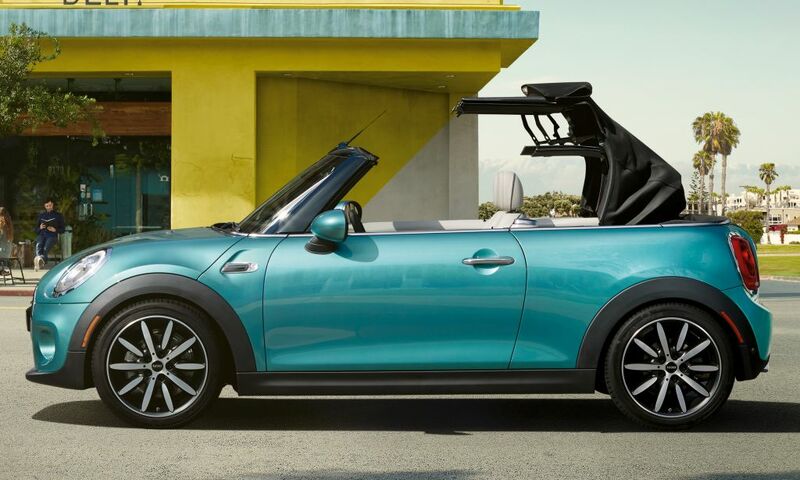 Stylish, affordable, sophistication, fun to drive is what defines Mini Cooper. I went in for a Mini Cooper and I love the 6 speed automatic transmission system which gives a smooth drive. I choose the Hardtop 2 door mini cooper. I am totally impressed with it for every option that it has in it. The colors Mini Cooper has to offer is amazing. The engineering and technology they have used in it amazing. Performance unmatched with any other car of this kind. You can enhance your drive with just a push button. The drive is fun, convenient and smooth. I love this feature the most: MINI Connected system allows you to get connected to your Facebook and Twitter status, or just play your favorite tunes, web radio, and Pandora stations through a gorgeous, silky smooth interface. Highly recommended to those who look for style, value for money and performance in a car. Have feedback for Mini Cooper?